Meet Ramveer Tanwar, a 26-year-old engineer who has helped revive 10 lakes in India over the past five years. 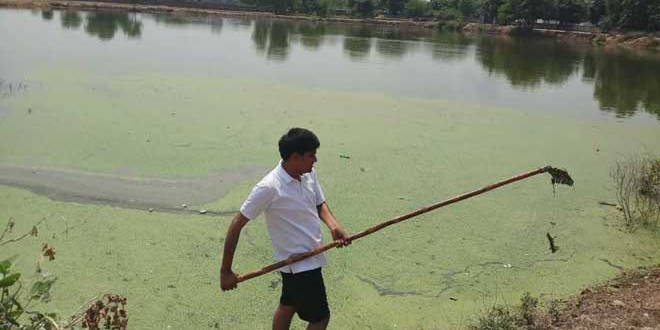 The country’s lakes have been ravaged by drought and pollution, but Tanwar and other activists are helping to restore the vital bodies of water. In 2013, Tanwar was completing his last year of university when he became concerned over the state of his home village in Greater Noida, Uttar Pradesh. As GoodNewsNetwork reports, the region had experienced 13 droughts in 15 years. Many of the older villagers were oblivious to the effects of drought, so Tanwar took it upon himself to educate and galvanize his younger peers. He began traveling from house to house to teach the locals about the critical condition of nearby water supplies. Tanwar also recruited his fellow students to gather villagers for weekly classes. Together, they discussed tactics to combat water shortage, and to help revive lakes and rivers. It wasn’t long before the villagers began to work together, hauling trash out of their water supplies. They also planted tree saplings around the water’s perimeter to protect the shoreline. To prevent any more trash from ending up in the bodies of water, Tanwar and his team installed double water filtration systems made of wood and grass. Local fish farmers were also encouraged to bring in aquatic bottom feeders. The fish eat up the smaller bits of particle water and keep the water clean. Tanwar’s “Jal Chaupal” clean-up efforts began five years ago. But, in that short period of time, he and other change-makers have resuscitated 10 lakes across the region. Furthermore, his initiative has sparked conservation efforts in more than 50 villages. The engineer’s efforts have been noticed by more than western media outlets. After learning of Tanwar’s efforts, the government of Uttar Pradesh launched separate “Groundwater Army” conservation groups in each district of the state. The 26-year-old has since been hired as the program’s coordinator. Because the government doesn’t have much funding, Tanwar has had to foot the bill for various expenses and supplies for the program. He works long hours, 6 days a week. Still, the millennial says he isn’t bothered by the extended hours or low pay. He is simply excited to continue his conservation efforts to protect India’s water.
? Alleged Poacher Killed By Elephants And Eaten By Lions Rapper 50 Cent Is Donating All The Profit From Sale Of $2.9 Million Mansion To Charity ?